When entering Tawonga South, Mount Beauty Holiday Centre is on you left as you come down the hill. 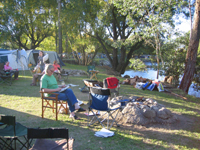 A range of Mount Beauty accommodation options on offer from cabins and yurts to caravan and camping sites along the river. We love our park, and think you will too! All of the above make The Mount Beauty Holiday Centre and Caravan Park is an ideal accommodation choice for couples, families and groups. Bring the family or bring your friends and come and experience one of the most picturesque and child friendly holiday destinations in NE Victoria. The Mount Beauty Holiday Centre is a perfect place to relax or base yourself to experience all that the Alpine High Country has to offer. Mount Beauty Holiday Centre has just become a family affair with Chris & Steves son, Mat and his wife Sarah joining the buisness. 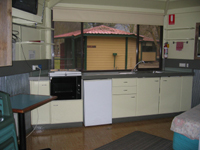 Specialising in caravan clubs / groups. Offering pancake breakfasts for special events. In the summer months we have entertainment by the river. Studio cabin with a double bed and 2-3 singles. BYO bedding (pillows, sheets & blankets). In August a 20% surcharge will apply on single night bookings on weekends. Studio cabin with a double bed and set of bunks. Shower and toilet. *More than 7 days ? full refund less $10 handling fee N.B: Deposits for cancelled bookings may be kept as a credit for future bookings. *Less than 7 days the above applies if we are able to re-book the accommodation. 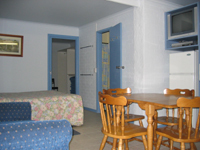 N.B: If unable to re-book the accommodation no refund will be given.